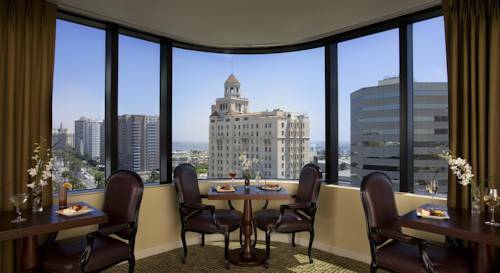 Let inspiration find you at Renaissance Long Beach Hotel. The artistic, urban Long Beach community resonates in our daily rituals and homegrown design, while the prospect of discovery lies around every corner. The Long Beach hotels Navigators can be your guide to the unexpected pleasures of the downtown scene art, culture, shopping, nightlife, or whatever stirs your soul. Open your senses and experience it all in our eclectic lobby including ocean-to-fork dining at SIP Bar & Lounge and incredible local musical talent. Unwind with a refreshing swim or craft cocktail on our third-floor deck, 111 Pool + Lounge, and enjoy killer views of the Pacific Ocean and the legendary Queen Mary from our Long Beach hotel. Come meet with success, celebrate in style and amplify your senses. Our hotel in Long Beach, CA offers an inspired experience for the modern traveler. Promenade Caf : The Promenade Caf , our on-site downtown Long Beach restaurant, boasts a casual atmosphere, perfect for a quiet breakfast before you set off for downtown Long Beach. SIP Bar + Lounge: Imbibe the local flavor with modern cocktails, great craft beers, fine wines by the glass, and perfectly paired food items. 111 Pool & Lounge: Enjoy our intimate pool setting overlooking Pacific Ocean and the historic queen Mary. Located on the third floor deck, our fire pit and sectionals provide the perfect setting to relax and enjoy Southern California s idyllic climate.